The Roman celebration of Vestalia was held each year in June, near the time of Litha, the summer solstice. This festival honored Vesta, the Roman goddess who guarded virginity. She was sacred to women, and alongside Juno was considered a protector of marriage. The Vestalia was celebrated from June 7 to June 15, and was a time in which the inner sanctum of the Vestal Temple was opened for all women to visit and make offerings to the goddess. The Vestales, or Vestal Virgins, guarded a sacred flame at the temple, and swore thirty-year vows of chastity. One of the best known Vestales was Rhea Silvia, who broke her vows and conceived twins Romulus and Remus with the god Mars. It was considered a great honor to be chosen as one of the Vestales, and was a privilege reserved for young girls of patrician birth. Unlike the other Roman priesthoods, the Vestal Virgins was the only group that was exclusive to women. "Historians have since considered the Vestal Virgins to represent the daughters of the king, while the Salii, or leaping priests of Mars, were thought to represent the king’s sons. 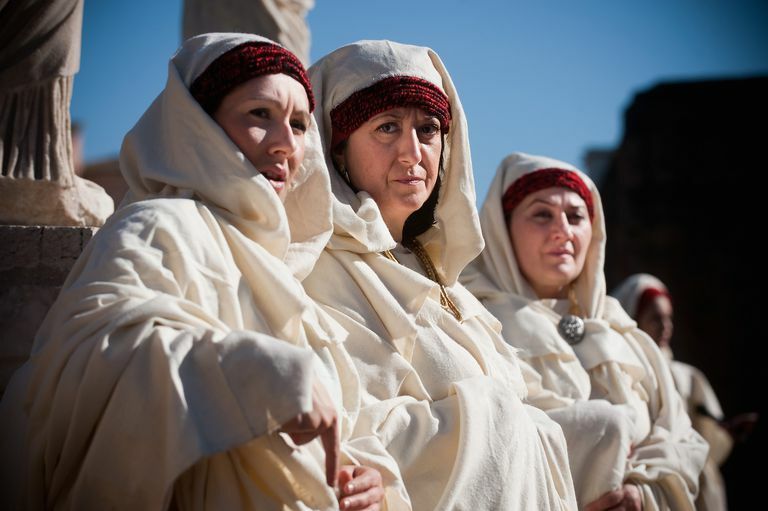 The participation of all of the City’s matrons, led by the flamenica Dialis, would indicate that Vesta’s hearth, and Her temple, was connected to all of the homes of individual Romans and not just that of the king’s Regia. The welfare of the City, and the welfare of every Roman’s home, resided within the wives of Roman families." The worship of Vesta in celebration was a complex one. Unlike many Roman deities, she was not typically portrayed in statuary. Instead, the flame of the hearth represented her at the family altar. Likewise, in a town or village, the perpetual flame stood in the stead of the goddess herself. For the celebration of Vestalia, the Vestales made a sacred cake, using water carried in consecrated jugs from a holy spring. The water was never permitted to come into contact with the earth between the spring and the cake, which also included sacred salt and ritually prepared brine as ingredients. The hard-baked cakes were then cut into slices and offered to Vesta. During the eight days of the Vestalia, only women were permitted to enter Vesta's temple for worship. When they arrived, they removed their shoes and made offerings to the goddess. At the end of Vestalia, the Vestales cleaned the temple from top to bottom, sweeping the floors of dust and debris, and carrying it away for disposal in the Tiber river. Ovid tells us that the last day of Vestalia, the Ides of June, became a holiday for people who worked with grain, such as millers and bakers. They took the day off and hung flower garlands and small loaves of bread from their millstones and shop stalls. Today, if you'd like to honor Vesta during the time of the Vestalia, bake a cake as an offering, decorate your home with flowers, and do a ritual cleansing the week before Litha. You can do a ritual cleansing with a Litha blessing besom. Much like the Greek goddess Hestia, Vesta watches over domesticity and the family, and was traditionally honored with the first offering at any sacrifice made in the home. On a public level, Vesta's flame was never allowed to burn out, so light a fire in her honor. Keep it in a place where it can safely burn overnight. When you're working on any sort of domestic, home-focused project, such as needle arts, cooking, or cleaning, honor Vesta with prayers, songs, or hymns. To me, there is something powerfully grounding about the Vesta tradition. It’s a perfect blend of spiritual focus, private ritual and personal freedom. I want my son to have a comforting face in the flame and a sense of family history that he can cling to during times of uncertainty. I want the same for myself. Like countless men who came before me, from the greatest of Caesars and soldiers to the simplest of family men, I have found that in Vesta. And I’m happy to say that I’m not alone.